Pop, rock and more that's cool for kids, fun for families and even great for the grown on their own. Full of humor, positivity and reality for everyone to enjoy and make good things happen. 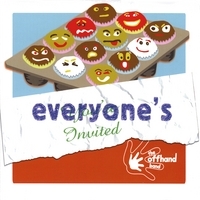 Stuffed with satisfying songs for people big and small, this debut album from The Offhand Band is a creative collection of catchy confections that you'll savor for some time to come. Cool for kids, fun for families and even great for the grown on their own, you'll have a blast hopping with the OHB from one style to the next -- pop and rock, R&B and country, old sounds and new, with even the occasional marching band thrown in. And with lyrics hosed with humor, packed with positivity and reveling in reality, you'll find yourself singing and dancing your way toward making good things happen. From the music to the words and whatever may be in between, with nobody talking down, you'll be lifted up by these songs that everyone can truly appreciate and enjoy together. Tell your friends... tell your enemies... tell everyone... because whatever your shape or size, happy or sad, hopeful or mad, the OHB is having a party, and Everyone's Invited! The Offhand Band is the creation of Mark S. Meritt, a musician, writer and armchair scientist who's just trying to spread a little harmony.